Generating data from a probabalistic model with known parameters is a great way to test that any analysis you have written is working correctly, and to understand statistical methods more generally. In this post I’m going to show you an example of generating (simulating) data from a probabalistic model. A probabalistic model is one that is stochastic in that it doesn’t generate the same data set each time the simulation is run (unlike a deterministic model). The following is actually the code that I used to generate the data in my post on importing data and plot here, so if you’ve been following this blog then you’re already familiar with the output of this post. This simulated data set consisted of 5 subjects, who were shown 20 trials at each combination of 7 contrasts and 5 spatial frequencies. First we set up all the predictor variables (independent or experimental variables) we’re interested in. ##  "S1" "S2" "S3" "S4" "S5"
As we’ve discussed, the paste0 command is for concatenating (sticking together) strings. The command above creates a character vector of five strings, starting with “S1” and ending with “S5”. Now that we’ve set up the independent variables from the experiment, we want to create a data frame with one row for each combination of the variables for each subject. We can do this easily with R’s expand.grid command. You can tell that something is a factor because instead of showing the summary statistics (mean, median) it just shows how many instances of each level there are. Now that we have the data frame for the experimental variables, we want to think about how to generate a lawful (but probabalistic) relationship between the experimental variables and the outcome variable (in this case, getting a trial correct or incorrect). I am going to do this in the framework of a logistic Generalised Linear Model (GLM). For this data set, let’s say that each subject’s chance of getting the trial correct is a function of the contrast and the spatial frequency on the trial. I’m going to treat contrast as a continuous predictor (aka a covariate) and spatial frequency as a discrete variable (a factor). I could treat both as continuous, but visual sensitivity as a function of spatial frequency is non-monotonic, so I thought this blog post would be simpler if I just treat my five levels as discrete. In the simple GLM I’m going to use, this means that each subject will have six coefficients: an intercept, the slope of contrast, and the offset for each level of spatial frequency. The formula ~ log(contrast) + sf_factor tells R that we want to predict something using contrast (a covariate) and additive terms of the factor sf_factor. If we changed the + to a * this would give us all the interaction terms too (i.e. the slope would be allowed to vary with spatial frequency). Note how our first 6 rows have all zeros for the columns of sf_factor: this is because all the first rows in dat are from sf 0.5, which here is the reference level. R has automatically dummy coded sf_factor, dropping the reference level (this defaults to the first level of the factor). A trial with a spatial frequency of 0.5 will have zeros for all the sf_factor columns of the design matrix. A trial with a spatial frequency of 1.5 will have ones in that column and zeros everywhere else. The above matrix has the subjects in the rows and the coefficients in the columns. That is, subject 2's "true" (i.e. generating) parameters are 7.194, 1.974, 2.279, etc. this_subj <- levels(dat$subject)[i]  # which subject? subj_rows <- dat$subject == this_subj  # which rows belong to this subject? The multiplication of the matrix X and the (row vector) beta above is equivalent to, for each row, multiplying each number in the design matrix by the corresponding beta value, then summing all these products to produce one number per row. This number is the linear predictor (and if we were dealing with simple linear regression, we'd be done now). For our application however, we want to turn the linear predictor eta into a probability that ranges from 0.5 (chance performance on the task) to 1. To do this we're going to use one of the custom link functions in the psyphy package for fitting psychophysical data in R.
links <- mafc.weib(2)  # creates a list of functions. dat$p <- links$linkinv(dat$eta)  # run the linear predictor through the inverse link function to get a probability. This function generates a vector of the same length as the number of rows in dat, each vector made up of one binomial trial (i.e. a Bernoulli trial), with probability given by the vector dat$p. Converting from "y" (correct / incorrect) to "response"
Finally, as a little extra flavour, I convert the binary correct / incorrect response above into a "left" or "right" response by the simulated subject on each trial. Note that you wouldn't normally do this, I'm just doing it for demo purposes for the data import post. Now I'm going to save a subset of the data here to a series of .csv files. These are the files we imported in my post on importing data. First, to make the data set look a little more realistic I'm going to shuffle the row order (as if I randomly interleaved trials in an experiment). I'm going to add a unique identifier (UUID) to each trial. This is a good thing to do in your experiment script. It makes it easier to, for example, check that some data set stored in a different table (e.g. eye tracking or brain imaging data) synchs up with the correct psychophysical trial. You could also do something where you add the exact time stamp to each trial. To do this I'm going to use the paste0 command, which you should already be familiar with from the data import post. This allows you to stick strings (text) together. On the line with paste0, the first part gives us the project working directory, then we go into the data directory and finally we create the filename from the subject name. That's one way to generate data from an underlying probability model. I've used it to generate some data to import and plot, but this is a really great thing to know how to do. It's useful for testing your analysis code (if you don't get back the parameters you put in, you know something is wrong). I also found I learned a lot about statistics more generally by simulating various tests and models. This post concludes the more "practical" content I've planned so far. In the next few posts I'm planning to talk about some more general things. If you have requests for future "practical" posts, let me know in the comments below. 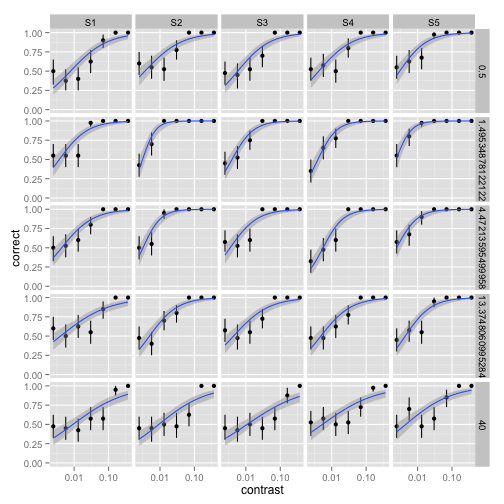 Posted in Reproducible research, Scientific programming, Tutorial-style and tagged data analysis, ggplot, probabalistic models, R on May 6, 2014 by tsawallis. Your second step after importing should always be to look at the data. That means plotting lots of things, and getting a sense of how everything fits together. Never run a statistical test until you’ve looked at your data in as many ways as you can. Doing so can give you good intuitions about whether the comparisons you planned make sense to do, and whether any unexpected relationships are apparent in the data. 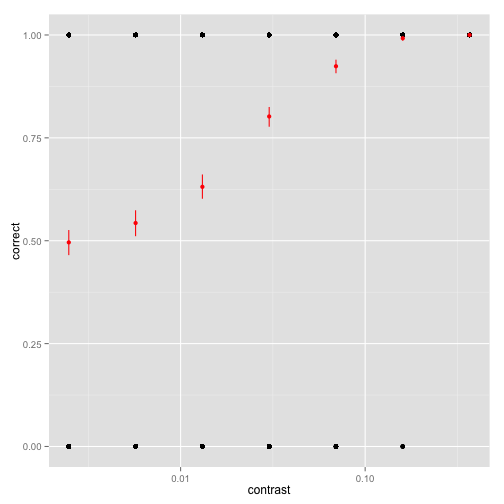 The best tool for reproducible data exploration that I have used is Hadley Wickham’s ggplot2 package. The first thing to note about ggplot2 is that it is better thought of as a data exploration tool than a plotting package (like base graphics in Matlab, R, or Python). In those systems, you typically create an x variable and a y variable, then plot them as something like a line, then maybe add a new line in a different colour. 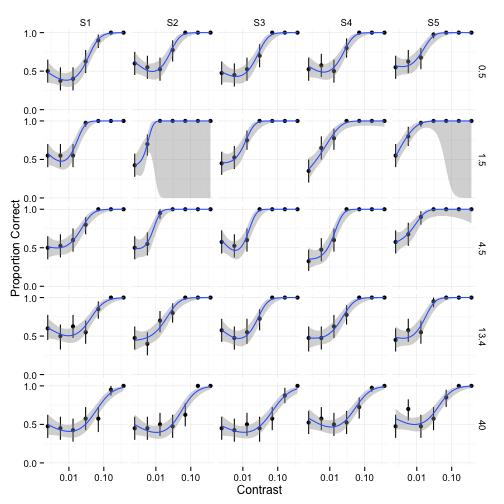 ggplot tries to separate your data from how you display it by making links between the data and the visual representations explicit, including any transformations. There’s a little introduction to this philosophy here. For the first few weeks of using ggplot2 I found this way of thinking about data took some getting used to, particularly when trying to do things as I’d done in Matlab. However, once you make the mental flip, the ggplot universe will open up to you. This command creates fig, which is a ggplot object, in our workspace. We’ve specified the data frame to use (dat), and two “aesthetics” using the aes() function. Aesthetics are how ggplot assigns variables in our data frame to things we want to plot. In this example we have specified that we want to plot contrast on the x-axis and correct on the y-axis. Now we get a plot of the data, with each correct trial as a point at 1 and each incorrect trial as a point at 0. But that’s not very informative, because there’s a lot of overplotting — we’re really interested in how often the subjects get the trials correct at each contrast level. That is, we want to know the proportion of correct responses. The mean_cl_boot command computes the means and bootstrapped 95% confidence intervals on the mean, for all the y-values falling into each unique x-value. These are shown as the red points in the above plot. Type ?stat_summary and look at the examples (or run example(stat_summary) to get an idea of what you can do out-of-the-box with this command. It also allows you to define your own functions to summarise the y values for each value of x, so it’s incredibly flexible. Now we can see that the mean proportion correct starts from 0.5 for low contrasts (i.e. 50% correct, or chance performance on the task) and gradually rises up to near 100% correct in an S-shaped fashion. The goal of this experiment was to see whether and how human visual sensitivity to contrast changes depending on the spatial scale of the information (loosely, whether the pattern is coarse or fine). While the basic data representation makes sense (i.e. looking at proportion correct), the plot above is not very useful because it averages over all the different subjects and over the experimental variable we’re most interested in (spatial frequency). Thus it doesn’t tell us anything about the goal of the experiment. fig <- fig + facet_grid(sf ~ subject)  # specifies rows ~ columns of the facet_grid. In this case I've used a Generalised Linear Model specifying that we have binomial data (this defaults to a logistic link function). The blue lines show the maximum likelihood model prediction and the grey shaded regions show the 95% confidence limits on these predictions. However, this model isn't taking account of the fact that we know performance will asymptote at 0.5 (because this is chance performance on the task), so the slopes look all wrong. A psychophysicist would now fit this model with a custom link function that asymptotes at 0.5. 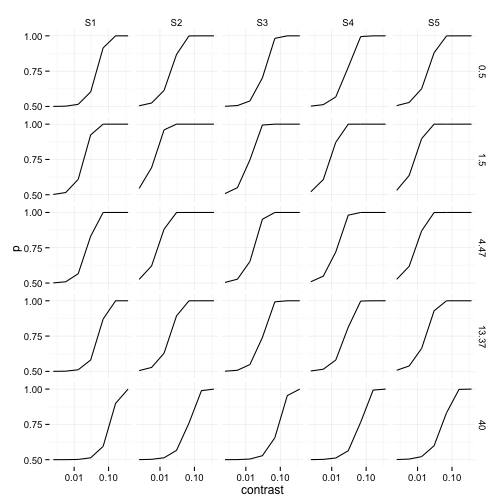 Such link functions are implemented in Ken Knoblauch's psyphy package for R.
We could implement that within ggplot2 as well, but instead here I will use a Generalised Additive Model (GAM) to show more flexible fitting of splines. This could come in handy if you didn't have a good approximation for the functional form for your dataset (i.e. you have only vague expectations for what the relationship between x and y should be). ## This is mgcv 1.7-28. For overview type 'help("mgcv-package")'. The above code fits a cubic spline ("cs") with three knots ("k=3"). Essentially this is a really flexible way to consider nonlinear univariate relationships (a bit like polynomial terms in normal GLMs). You can see that these data are probably overfit (i.e. the model is capturing noise in the data and is unlikely to generalise well to new data), and some of the confidence regions are pretty crazy (because the model is so flexible and the data are not well sampled for the observer's sensitivity) but that it gives a reasonable impression for the purposes of exploration. If you scan down the columns for each subject, you can see that the point on the x-axis where the red curves have the steepest slope is furthest to the left for spatial frequencies of 1.5 and 4.5 cycles per degree. These observers reach a higher level of performance with less contrast than in the other conditions: their thresholds are lower. Humans are most sensitive to contrast in the 1–4 cycles per degree range (Campbell and Robson, 1968). What would happen if we wanted to see whether performance changed depending on the side of the retina (left or right of fixation) the grating was presented? Perhaps sensitivity is different, or the person has a bias in responding to a side. We can look at this by simply adding a new argument in the aes() function when we call ggplot: colour = target_side. Try it at home! There's an example of doing this in the plots.R script on my github page. Here you can also see how the plots are saved to the /figs subdirectory, where a document file (like a .tex doc) can be set up to automatically pull in the figures. You can also see a nice vector graphic version of the final figure above. This post was just a little taste of what you can do in ggplot2, with a focus on vision science data. There are many more thorough introductions for ggplot2 available on the web, like here and here. I find that The Cookbook for R has heaps of useful little tips and code snippets, as well as showing you lots of basic ggplot things in the plotting section. If you want an example of some published figures made with ggplot2 as well as the code that generated them, you can see our recent paper here. In this post, I will demonstrate one way to import and collate a data set (using the R environment). This is a follow up to a post in which I argued that a good principle for reproducible research is to avoid humans touching data. That is, once the data from the experiment are saved we want them to be “read only” and never altered by a human in some undocumented way (such as editing in a spreadsheet). First, we need a data set. To make this more interesting let’s build on a classic paper from vision science. Imagine we’ve conducted an experiment similar to the classic Campbell & Robson (1968)^1 study but with a few modifications. As a participant in our experiment, you’re seated in front of a monitor showing a grey screen. You’re going to be shown a sequence of trials, and for each trial you make a response with a button press. On each trial you are asked to keep your eyes on a small dot on the centre of the screen. On each trial, a pattern of dark-and-light stripes (a grating) is shown on one side of the screen (left or right of your eye position). The computer randomly decides whether to present the grating on the left or on the right (the other side just stays as the grey background). You have to respond either “grating on the left” or “grating on the right” — you can’t say “I don’t know”. The computer waits for your response before showing the next trial. We are going to vary both the contrast of the grating pattern (how different from grey the dark and light stripes are) and also the spatial frequency of the pattern (how wide the bars are) over trials. If the contrast is so low that you can’t see the grating, your responses across many trials will be near chance performance (here 50% correct). If the grating is really easy to see, your performance will be near 100%. We determine how your performance on the task changes as a function of contrast, for each spatial frequency tested. A few things to notice here: each comma , in the file denotes a new column, and each new line denotes a row. Secondly, note that there’s a header row: the first line of the file contains column names for our variables. Finally, notice how our target_side and response columns contain text strings (left and right). The reason I’ve done this is that it makes the data easily human-readable. It’s obvious what the entries mean (imagine if instead target_side could be either 0 or 1). This can be used to great effect to avoid needing a data key later. This couldn’t be simpler. Go here and get the right binary for your system, install it, then immediately go here and get RStudio, which is awesome. To follow along with my stuff here, you can install any packages I use (the library() calls in future posts) via RStudio’s “Packages” tab. While I’m going to demonstrate this stuff using R, I would encourage you to follow along in your package of choice. I’d be interested to know how easy / hard it is to duplicate this stuff in other environments (for example, last I used Matlab handling .csv files with mixed numeric and text was a massive pain). Now we want to read each subject’s data file into R, then stick the files together to create one big data file. ##  "A text string42, another text string"
##  "A text string41, another text string"
##  "A text string43, another text string"
and subject 2’s results are in the file “data_S2.csv”, and so on. The following script uses a for loop to read in the data, then appends it to a data frame called dat. dat <- data.frame()  # create an empty data frame. Data frames are the most important (or at least useful) data type in R, and what you’re going to be using a lot. Many methods use data frames. The most awesome thing about a data frame is that it can store both numerical data and text. This allows us to read in that csv file no problem, where other basic data types would really struggle (I’m looking at you, Matlab). 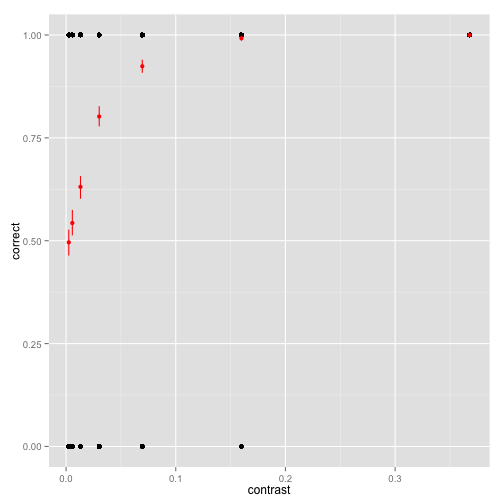 See how we get some distribution summaries for the covariates (e.g. contrast), but only told how many instances of each factor level there are? Neat huh? dat$correct <- 0  # initialises the variable 'correct' with all zeros. Now we have a variable in the data frame dat that gives a 1 where the subject was correct and a 0 elsewhere. In the next post, I will show some basic graphical exploration of this data set using the ggplot2 package. You can check out the repository for this and some upcoming posts at my Github page. Campbell, F. W., & Robson, J. G. (1968). Application of Fourier analysis to the visibility of gratings. The Journal of Physiology, 197(3), 551–566. During my PhD I learned to program in Matlab. I’d never done any programming before that, and I found it to be a rewarding experience. As is typical for people in vision science, I did pretty much everything in Matlab. Stimuli were generated and presented to human subjects using the CRS Visage (in my PhD; programming this thing can be hell) and now the excellent Psychtoolbox. Early on in my PhD I also moved away from SPSS to doing data analysis in Matlab, too. An early project in my postdoc (see here) involved some more sophisticated statistical analyses than what I had done before. For this, Matlab was an absolute pain. For example, the inability (in base Matlab) to have named columns in a numerical matrix meant that my code contained references to column numbers throughout. This meant that if I wanted to change the order or number of variables going into the analysis I had to carefully check all the column references. Ugly, and ripe for human error. Cue my switch to R. For statistical analyses R is pretty damn excellent. There are thousands of packages implementing pretty much every statistical tool ever conceived, often written by the statistician who thought up the method. Plus, it does brilliant plotting and data visualisation. Add the ability to define a function anywhere, real namespaces and the excellent R Studio IDE and I was hooked. I would try to avoid using Matlab again for anything on the analysis side but some light data munging (this is also wrapped up in my preference for science in open software). For several years now I’ve been doing pretty much everything in R. For our latest paper, I also did my best to make the analysis fully reproducible by using knitr, a package that lets you include and run R analyses in a LaTeX document. You can see all the code for reproducing the analysis, figures and paper here. I’m going to work through the work flow that I used to do this in the next few blog posts. While R is great for stats and plotting, unfortunately I’m not going to be able to fully replace Matlab with R. Why? First, last I checked, R’s existing tools for image processing are pretty terrible. A typical image processing task I might do to prepare an experiment is take an image and filter it in the Fourier domain (say, to limit the orientations and spatial frequencies to a specific band). I spent about a day trying to do this in R a year or so ago, and it was miserable. Second, R has no ability to present stimuli to the screen with any degree of timing or spatial precision. In fact, that would be going well outside its intended purpose (which is usually a bad idea – see Matlab). So my “professional development” project for this year is to learn some Python, and test out the PsychoPy toolbox. In addition I’m interested in the data analysis and image processing capabilities of Python – see for example scikit-learn, scikit-image and pandas. I’ve had some recent early success with this, which I’ll share in a future post. It would be so great to one day have all my scientific computing happen in a single, powerful, cross platform, open and shareable software package. I think the signs point to that being a Python-based set of tools.